My first step when working on a new medallion is to come up with a concept. What I had in mind for this project was an idea that I had been playing with for some time. I mentioned my weakness for collecting “chachkis” in a previous post. In actual practice, I collect all manner of handmade items. 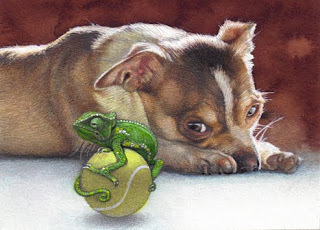 If there is a theme to my collecting, it would be that I am attracted to things that are small, colorful and focus on animals (particularly dogs and horses). Within those parameters I purchase items made from all sorts of materials and across a wide range of artistic styles. But if there is one category that I collect with particular enthusiasm, it’s Artist Trading Cards. Artist Trading Cards (ATCs) are works of art the size of a baseball trading card (2.5″ x 3.5″). They grew out of the mail art hobby and are really popular among collage artists like my mother. The idea was that the cards were a great way to share techniques with other artists. That’s why the cards are usually traded, so that each artist can see first-hand the methods the other uses. 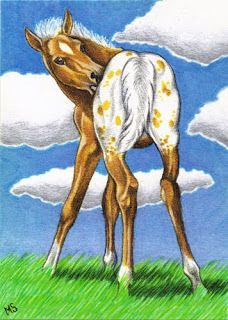 In more recent years, illustrators have begun making the cards, too, though for them the cards are often sold to collectors rather than traded. 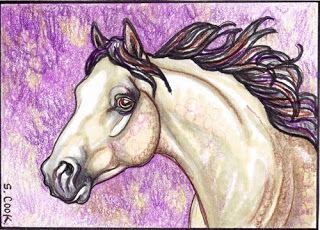 (Technially the cards are then called ACEOs – Artist Cards, Editions and Originals.) I collect illustrated cards, rather than collage and mail art cards. And for the most part, I only collect originals. That’s because seeing the techniques up close is part of the attraction I have. I learn a lot be being able to look up close. 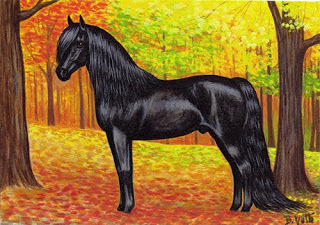 Since discovering Artist Cards, I have wished they were commonplace in the model horse community. I would love to be able to purchase (or trade for) the work of many of my colleagues. There really isn’t a learning opportunity like being able to examine good work up close! All that would be needed was a bas relief that fit the proscribed dimensions. 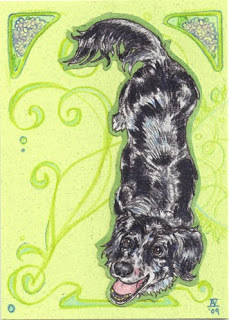 That is the thing about ATCs and ACEOs. Styles range across the spectrum and so does the media used. A favorite in my own collection is a pair of lambs done in fused glass. (Because it is mostly translucent I was at a loss for photographing it properly, so it’s not included here.) I have another that is quilted. The only constant, non-negotiable item is the dimensions. The piece has to be 3.5″ x 2.5″. “Emma Nouveau” by Addi Velasquez, mixed media (2009). Addi did this one as a gift during her recent visit. It has been that very restriction that has been the roadblock for me. I love design work; that’s part of why I like working with bas relief. But I’m not good at very structured formats. I like overlapping shapes and irregular outlines. If I couldn’t fall back on hanging the nose off the edge or projecting the ears past the top, I wasn’t sure how I was going to make the piece more than a “horse head in a box”. I had tried a number of times with no real success. This time, however, I decided that time was running too late to find a holiday design. I had an assortment of partially-sculpted horses that were designed to fit the ATC format, so I was going to make it work somehow! All I needed was some self-employment tough love. I told myself I was sitting in front of the clay until I figured something out. Tomorrow I’ll post what a wish for freedom (or at least some lunch) drove me to come up with! 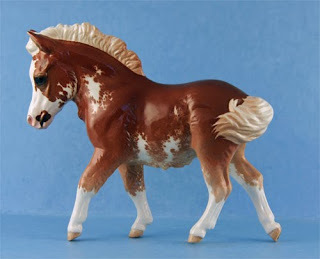 I had originally thought I would sell her and keep the second (as yet unfinished) Jellibaby, but I want to wait and pair her with one of Addi’s really neat mares once they are ready. I have her mother’s color pictured so clearly in my mind that I need to make them a pair. But that isn’t going to happen unless I place her out of sight in the back of the china cabinet before I get more attached to her. She’s a really cute baby! I am also color-correcting pictures of Addi’s second Vixen/Imp pair. She’ll probably run those on her own blog, so watch there for them.